Midland, MI: In the second to last game in the 2018 Midwest League season, the South Bend Cubs looked to be on their way to a series opener win over the Great Lakes Loons, but in the bottom of the 7th, a bases clearing double hit by Matt Cogen altered the Cubs plans and the Loons closed the game with their 60th win by a final of 6-3. Cubs starter Erling Moreno put himself in line for the victory with five strong innings of one run ball. By striking out five batters, Moreno closed his 2018 season on a positive note against the Loons from Dow Diamond. When Moreno exited, however, was when the trouble came along. 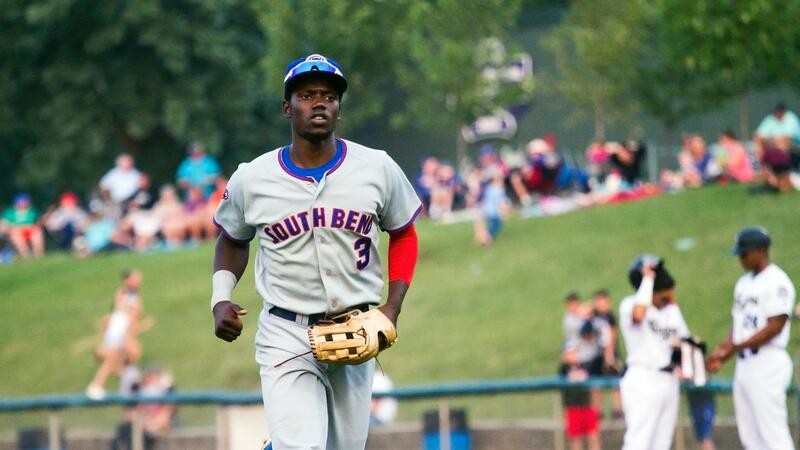 With a 3-1 lead heading to the bottom of the 7th, South Bend used a pair of doubles hit by Clayton Daniel and Chris Singleton to jump into the lead. After a scoreless 6th inning, Manuel Rodriguez headed back to the mound for his second frame and immediately ran into trouble. On two walks and a single, Rodriguez loaded the bases full of Loons. When Cogen came to the plate, it was his Midwest League debut. Before the at-bat, Rodriguez was pulled in favor of Luis Aquino. On a sharp line drive hit to center field, Cogen crushed a double for his first hit as a Loon. The line drive flew over the head of center fielder Jimmy Herron all the way to the wall. In an instant, it was a 4-3 Great Lakes lead. They plated one more run against Aquino in the inning and led 5-3 at the end of seven frames. The Cubs had their own rally in the top of the 9th, loading the bases against closer Devin Hemmerich. Although the bases were juiced with two outs, Rafael Narea grounded out to the shortstop Deacon Liput. With the tying run in scoring position, South Bend ran out of outs and fell 5-3. With the loss, the Cubs drop to 63-74 heading into the final game of the season tomorrow. First pitch from Midland is set for 2:05 PM tomorrow afternoon.